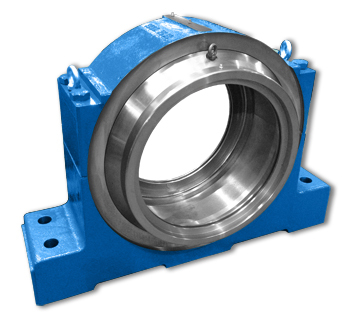 Another custom Bearing Housing manufactured by Bri-Mac. Made from Cast Steel, This Housing is a one piece Solid unit with detachable Steel End Covers. Custom slots were needed in the feet and a central locating slot in the base. This month Bri-Mac exported some strong Cast Steel Bearing Housings to Mexico. These Housings have a SOLID base for greater strength and are also equiped with a special sealing configuration to deal with the harsh enviroments of a Sugar Mill. A double Lip Seal combined with Felt Seal greatly improves the longevity of the Bearing inside. 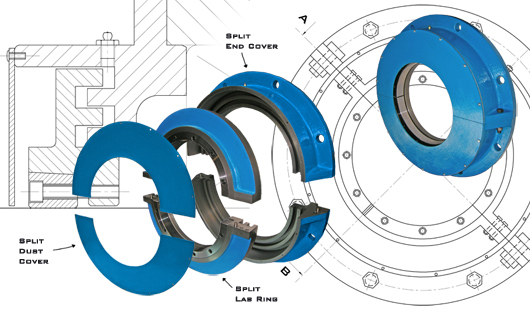 Bri-Mac can design and manufacture improved sealing configurations to fit any Bearing Housing size or style. 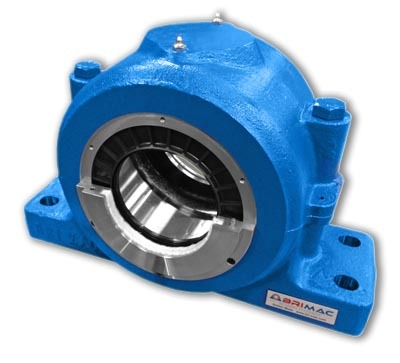 Showcasing the diversity of Bri-Mac's capabilities, Some rare and obsolete Bearing Housings needed replacing. As there was no information on these rare Bearing Housings, Bri-Mac reverse engineered the broken samples to produce these new Steel Bearing Housings. Any challenge is no problem for Bri-Mac. 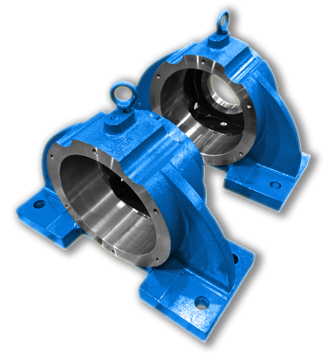 This month Bri-Mac produced some large Cast Iron Bearing Housings with detachable End Covers. With an improved double groove sealing configuration, the maintenance and downtime was reduced and the Crusher Plant could be much more productive than ever before. 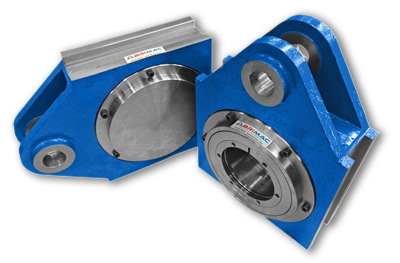 Another Bearing Housing solution from Bri-Mac. August brings Bri-Mac an order for some solid Flame-Cut Bearing Housings with detachable End Covers. Manufactured from high quality Steel with great accuracy and smooth finish. These Bearing Housings arrived to the Customer 2 weeks from receiving an order. Bri-Mac Split end covers with double lip sealing configuration. Easy to replace and upgrade your existing sealing system without the cost of breakdown. 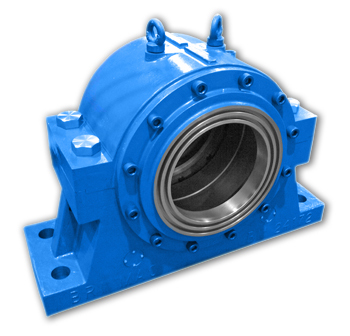 Bri-Mac are the experts at providing Bearing Housing Solutions Worldwide. This month we manufacture a large order for SNL 30/530 Bearing Housings produced with 6 Cap & Base Bolts to provide that extra strength. Any shape, size or custom requirements are no problem for Bri-Mac. 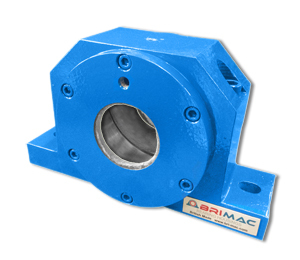 This month Bri-Mac complete a repeat order for some standard THDS Bearing Housings but made from Cast Steel. Our customers continue to place orders because they know Bri-Mac can always produce high quality products time again. 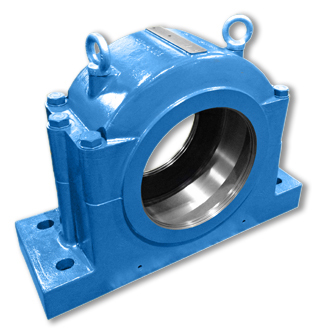 April brings Bri-Mac an order for some Cast Steel SDG type Bearing Housings. 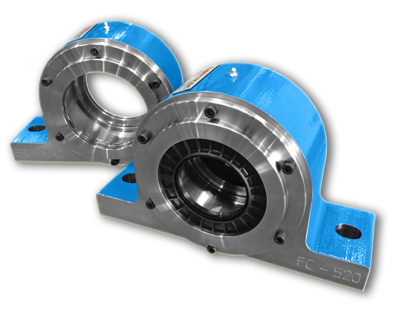 These larger Bearing Housings are no problem for Bri-Mac. Any size bore can be machined with great accuracy and great finish. With a machined Steel End cover it provides a much stronger and cleaner product satisfying our high profile Customers time again. 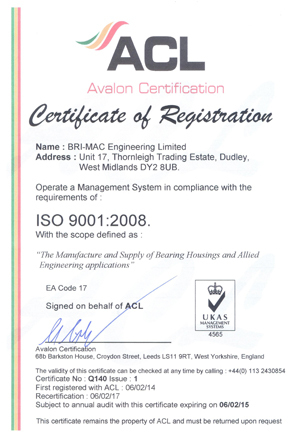 Bri-Mac qualify for ISO 9001:2008 Quality Assurance Certification. 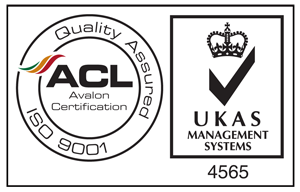 Showing our standards and procedures remain high to deliver the best product for our customers. Dimensional Inspection Reports, Material Certificates and Test Certificates are available on request to provide full traceability. 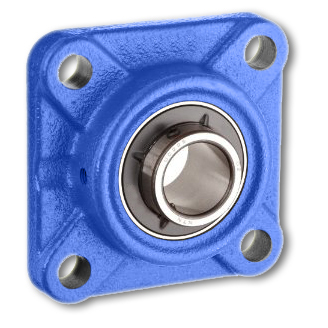 Standard SSNT Bearing Housings made from Flame-Cut Steel are becoming more and more popular. February brings more orders of this type due to some Steel Mill breakdowns that require a rapid and strong solution. Bri-Mac deliver the goods again with our Flame-Cut version on the SSNT. 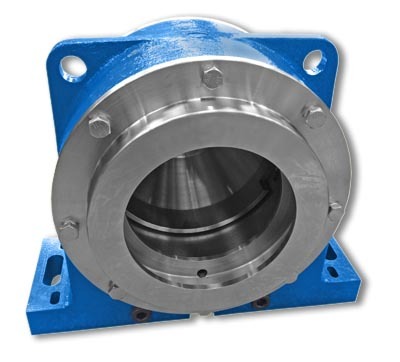 To start the year Bri-Mac have won a very large order of UCF type Bearing Housings. Produced from Steel our product excels the quality and performance of standard Cast Iron units resulting in another happy customer.